Whether you want to free up a weekend or just want the lawn mowing to be taken care of, Paul’s Mowing will take care of it. We can also help with overall turf maintenance like topdressing to keep the grass healthy. Lawn mowing isn’t the hardest thing in the world, but it is tedious. Especially when you could be sitting in shade with a cool drink, while someone else does it. With Paul’s services, you’ll be set on that front. Give us a call on a lazy day when you can’t be bothered, or eliminate worrying about lawn care altogether by scheduling a regular visit with us. The gardeners will do the work whenever is most convenient for you. We do the job and get out of your hair so you can enjoy the smell of fresh cut grass without the hassle of pushing the lawnmower. Book your one-time mowing or regular service for when it suits you best. It’s easy! Just give us a ring and tells us what you need done, or use our online booking form and check the boxes as you need! Relax on the day of the appointment as our professionals arrive promptly anywhere in Melbourne, with all the necessary tools, required for the job. The experienced technicians will get your lawn back in good shape and keep it that way! Enjoy Result. Our mission is consistently delivering quality on each appointment. We consider a job done when we see the customer smiling and the lawn vibrant and orderly. …And we are good at it! The service we offer is customisable and hourly-based. That means you decide how much time you need us for and you pay just for that. If the lawn mowing job is completed earlier, the technician will do additional tasks upon your request in the allotted time slot. That may be everything related to lawn care or general gardening tasks. The gardeners will inspect the lawn’s overall condition so they have an idea what they are working with. It’s actually easier to mistreat a lawn than most people think. The professionals will know what your turf needs. They can also give you free advice on how to look after your specific type of turf, any special plants, or areas in your garden. With Paul’s there are no compromises with the quality. We are as good at cutting deals as we are at cutting grass. Looking for More Than Just Mowing? 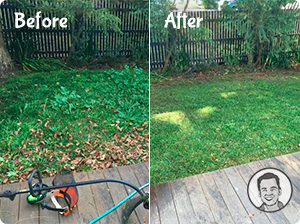 Garden Maintenance including Weeding, Fertilising, Mulching, Lawn Topdressing, and more. If your yard needs a professional’s touch and some gardening magic, schedule one with a simple call or a few clicks!